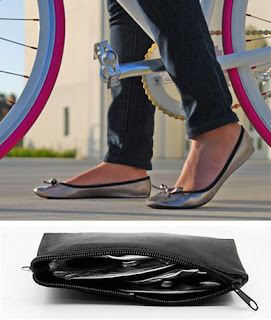 As low as $9.90 for a Pair of Portable & Foldable Flats & Carrying Pouch, a $22 Value! Today at Mamasource you can get a pair of portable and foldable flats from BellaSole for as low as $9.90. These regularly cost $22! You can choose from several different colors and patterns. The deal is on sale for $11, but new Mamasource customers can use the code mar10 at checkout to save 10%, making the deal $9.90. Ditch the painful heels and dance the night away in BellaSole shoes. These portable and foldable flats feel as good as slippers, but are chic enough to compliment your hottest outfits. From nights out on the town to walking city commutes, these durable and stylish foldaways will become your constant (and comfy) companion. Each pair includes a convenient zipper pouch, which also holds a credit card, cash, and cosmetics.